Productivity is something that everybody is running for. For driving, we have Waze app, which is showing the fastest route to get there. For music, we have Shazam. What was life like, before Shazam? We would listen to a song and nobody knew it. This is the difference between having a great resource or not. We have spent a couple of months to build a showcase that will help you increase work productivity and we are happy to finally present it. You will find different web tools and services like web development complete solutions, WordPress themes, websites creators, WordPress plugins that will help you sign online documents and contracts directly on your website and many others. WP Esignature by ApproveMe is by far the most powerful WordPress plugin for document signing. Hands down. It’s a complete solution that makes your life as a freelancer or business owner so much easier and most importantly, secure. With its built-in contract builder, you can easily create legally binding & court recognized contracts directly from your WordPress site. It’s intuitive, and very easy to use even with little to no technical background. And that’s just one of its features. WP E-Signature integrates with almost all of your existing WordPress plugins to automate your current user or client onboarding process whether it’s before or after a WooCommerce checkout or a during a Gravity, Ninja WP Forms or any of the other WordPress Forms workflow. Now you can automatically follow up with customers or clients who have not signed your contract. Dynamically input their customer data so you don’t have to manually type repetitive information into your contracts. You’ll be amazed at how much time you’ll save with all this contract automation! Every single document created with ApproveMe’s WPEsignature plugin is 100% UETA/ESIGN compliant. That means that your contracts will adhere to some of the strictest policies around the world so you never have to worry about the safety of your clients or your business. The WPEsignature plugin starts at $177/year and includes unlimited users. That means anyone on your team can use the power of WP E signature to manage clients without having to worry about logins and passwords. To see the full power of this plugin, check out their demo! It’s one of the best demos we’ve ever seen. We guarantee it’ll get you excited about what this plugin can do for you and your business. You’d like to be a little bit more creative when you design your pages and post, but CSS and HTML are not your best friends? Even with no coding skills you can achieve excellent results with the right tool in your hand. 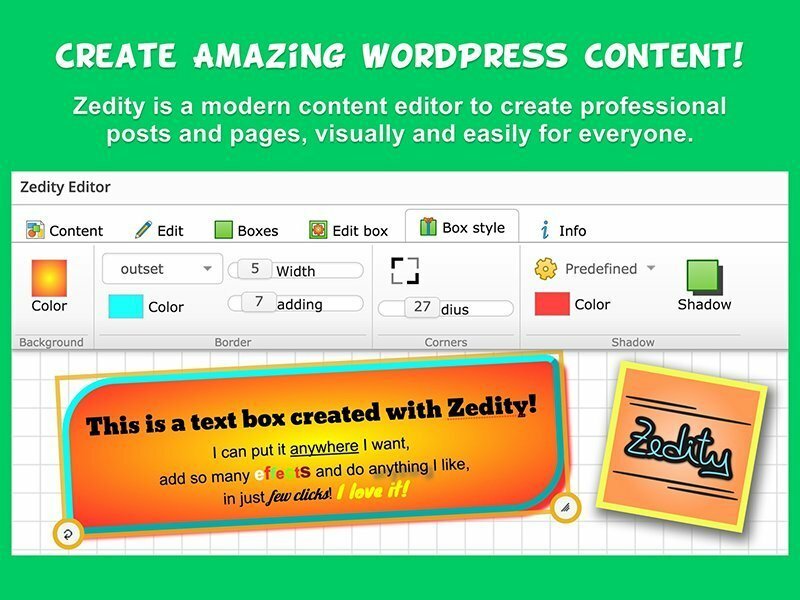 With more than 350,000 downloads and counting, Zedity is the right visual editor WordPress plugin, which helps you create your pages and posts easily and quickly, with total design freedom. On their blog you can find several tips and tutorials that guide you through the process and their support team is friendly and eager to help you. Zedity comes in 2 versions, free, which you can download right away, and premium, which offer all the possible features that you need (a complete list is available of their website). The premium version, which comes with a lifetime license, i.e. you pay only once, starts at $39 only, including 12 months of free updates and technical assistance. Get started with Zedity and make you WordPress experience much better! Xfive is a different, full-service web development company. They were founded in 2006 and their team is united since then, with more than 10 years experience. These developers are professional, friendly, flexible and transparent. You will get used working with this kind of people and you will never go back to the average web development companies. They are making partnerships with agencies and start-ups, they can be hired as a private team, to be an extension of your company or you can work with them for single projects. They have great experience in adapting to the different customers, they have worked with small businesses and individuals with not so complicated needs, to largest corporations in the world, like Microsoft, eBay or Twitter. The process of working with Xfive is simple, there are only 3 steps. You start by sending all your project details and after that you will receive the quote. Approve it and you will receive the invoice that can be paid via several methods: PayPal, credit card or bank wire. Get in touch with them. Among the website monitoring services available on the market, UptimeRobot is considered one of the best solutions. Their free forever plan is having 50 monitors from all over the world that is checking every 5 minute if your website is down. If they find issues, you will be notified fast via e-mail, SMS, Twitter, push, Slack etc. It can integretade with slack, HipChat, Pushover or Boxcar. UptimeRobot is easy to install and set up and it has a friendly and professional interface. If you need more features, you can upgrade your free plan to a custom pro plan that will be adapted for your needs. The pricing for the basic pro plan starts from only $5.5 / month, it is an affordable cost. Give it a try. Ultra Theme is a flexible, powerful and complete WordPress theme launched by Themify, one of the best WP theme creators on the market. They have an excellent track record and a support team that you will love. Ultra has everything you can think of: a drag-and-drop builder, ready to go templates, it is fully responsive and mobile friendly and last but not least, is fast. Check the demo. In 2017 is mandatory to have forms on your website that work and have an excellent designs. WPForms is one of the best WordPress forms plugin available on the market in the last years. They have a drag & drop online form builder that allows you to create powerful WordPress forms in minutes, not hours! Give it a try and convince yourself. There are several marketplaces for web designers and web developers and Codester is powerfully coming from behind. It is a new place where people can buy and sell all kind of useful scripts, website themes for all platforms (Joomla, WordPress, HTML, Drupal, Presto etc), plugins and apps. If you want to sell on Codester, it is really simple to start your online store and earn your commission. Keep in mind that they don’t require an exclusivity on your items. Having a great analytics plugin for your WordPress website is mandatory. You need to know every moment, week and month what is happening and what you can improve. All of that is quite easy if have the right plugin. MonsterInsights can do all of that for you and it’s among the best rate Google Analytics plugin for WordPress, with over 12 million downloads. OptinMonster is an excellent WordPress plugin that will help you convert visitors into subscribers and customers and it’s highly appreciated, being used on more than 300,000 websites with excellent results. It works with most popular email service providers like Constant Contact, Aweber, MailChimp, Campaign Monitor, Mad Mimi, etc. It can do lot of things, check their website. Newspaper-X is a beautifully designed WordPress theme developed by Colorlib, a new player in the market that is building excellent themes and they have a great support team. This theme can be used for many online magazines or blogs and it’s free, even for commercial scopes. Start using it from today. If you are looking for an excellent logo designs and your budget and timing are not flexible, 48HoursLogo is one of the best options on the market. You can easily start an online logo design contest for only $29 and you will receive several logo concepts within hours. Give it a try. Meridian Themes is a great place to spend time if you are looking for cool WordPress themes, made from the start to be fast, secure and beautiful. These guys are new on the market but they are doing a good job and you will find that their themes are flexible and easy to customize, something that is quite rare. Check their portfolio and demos. 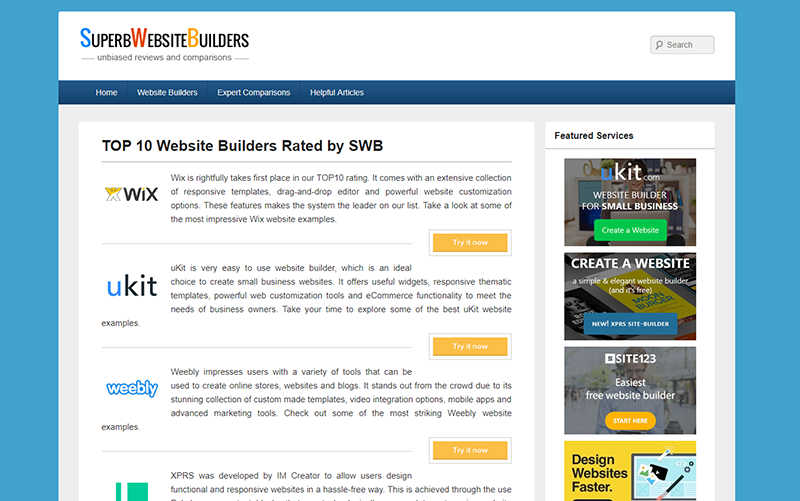 SuperbWebsiteBuilders offers detailed and unbiased reviews of the best website builders available out there nowadays. The website is known for its professional approach to the process of reviewing, analysis and comparison of well-known web building services. Each website builder is personally tested and reviewed by the chief editor of the resource, Howard Steele, who has the firsthand knowledge of all the niche requirements. The website also contains interesting articles, comparisons and ratings of the top website builders newbies and web design pros can use when choosing the most suitable platform. With RumbleTalk you can easily chat online with customers, users, a community, or team using a single, public chat room or in one-on-one private rooms. There are more than 550,000 group chats created so far. You can send a private message to other participants in the chat room and have one-to-one audio and video calls. Check it. SiteGround is one of the best hosting solutions on the market. It was built from the very first day to have a top speed, unmatched security, 24/7 fast and expert support. It is trusted and used by more than 500,000 domains! Using wpkube coupon you will get 60% off the price. WP Engine provides excellent managed WordPress hosting for mission critical sites around the world. These guys are offering an amazing support, enterprise class, & optimized for WordPress. Ecommercebooth is offering a discount coupon with 30% off the price. 40DollarLogo is the perfect place for obtaining an excellent logo design with only $40. The process is really simple. For this amount, you will get 2 custom logo design concepts by 1 experienced designers and unlimited number of revisions for 14 days from the moment you are receiving the designs. Get your logo. InvoiceBerry is an excellent invoicing platform, easy to use and fast. You can customize your templates, track invoices and many other cool things. All the plans have the same features included and they are offering even a free plan. Make your account and check how it works. You can set up your tweet as well as your schedule when to tweet with EvergreenFeed and it then will automatically take a random tweet from your list and publish it. You will never again have to schedule your tweets once they are in the system. Check out their free plan. Host-Tracker is an excellent website monitoring services that will instantly notify you of problems through SMS, Email, Skype, Hangouts, Viber, Telegram, HTTP Post or Voice Call. The pricing is friendly, it starts from only $3.25 / month. Try it. SnapPages is a well-known website builder that is fast and it can be used to create gorgeous websites. You will find several responsive website templates designed to look beautiful on any device. Keep in mind that all these websites are responsive and mobile friendly. The pricing starts from $4 / month. All of the above web tools and services were handpicked and most of them are offering free trials or at least have a demo that shows you exactly what can do for you and how you will benefit from using it. Please let us know what you liked most and if we should include also other great solutions.